Ryan, Rocky and Jon racked several batches of Imperial Stout into the used wine barrel. The beer will age until the desired barrel flavor is achieved. Present: Chip Ford, Ryan Jilek, Rocky Stoltz, Jerry Ford, Alan Church, Dale Sattler and Jon Stika. Discussed K of C Beer Taste and Homebrew Competition set for September 20th. Discussed HRHB picnic set for September 8th. Ryan, Rocky and Jon will plan to fill the used wine barrel with the collectively-brewed Imperial Stout on Sunday, August 26th. Jon brought Belgian Wit, Dale brought Saison, Jerry brought Big Eddy Scotch Ale, Rocky brought Zonker Stout, Paul brought Pale Ale and Alan brought Lambic Ales, Ryan brought Mead. 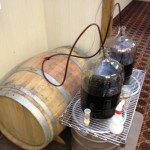 You are currently browsing the Heart River Homebrewers weblog archives for August, 2012.